The Wabash Valley business community, along with Indiana State faculty and staff, are invited to an 8 a.m. session to hear the event's corporate keynote speaker Angela Morelock, a certified fraud examiner who leads the forensic accounting and investigations team for BKD - one of the largest U.S. accounting and advisory firms. The day's noon luncheon keynote speaker will be Gretchen Winter, Executive Director of the Center for Professional Responsibility in Business and Society at the University of Illinois at Urbana-Champaign's College of Business. "Advisors and professors often say that students' level of knowledge about ethics and how it pertains to their lives is not where it should be," said Meagan Stenger, a junior insurance and risk management major from Shelbyville, Ill. "We hope that they turn out for the conference and learn that ethics is a much bigger concept than what they might think." Online registration for the corporate keynote and the main breakout sessions and luncheon is available at http://indstate.edu/ethics. 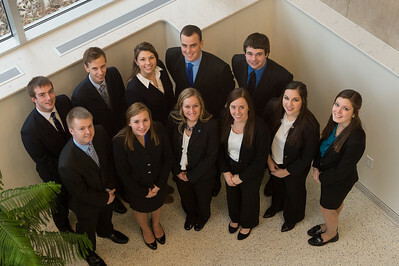 Conference check-in will begin at 9:30 a.m. March 2 at Hulman Memorial Student Union. The 11 juniors in the Networks Scholars program were split into four teams: programming, operations and logistics, finance/fundraising and marketing. Ben Weber, a junior finance and financial services major from Huntingburg, said the finance team has raised more $13,000 from sponsoring organizations to help host the conference. "This is a big project for students to put together, and I've learned the importance of being proactive when working as a team and making sure that you know all of the details of what the other groups are doing," he said. "There are a lot of steps that go into planning an event like this, and I'm looking forward to seeing it all come together on March 2." The Networks Professional Development Program will host the 11th annual Ethics Conference on March 2. Beginning at 10:00, all morning and afternoon breakout sessions are open to students, University and the Wabash Valley Community members.